On the morning of October 4, Georgianna & I met Jan & Steve Harrison and headed south on I-85 for this year’s Cruisin’ the Coast®. Participating in Cruisin’ the Coast® has been a bucket list item for some time and this year we were going to check out the cruise. A note at this point is that to be officially registered with Cruisin’ the Coast® you must have a 1989 or older vehicle. That is not to say that if you don’t have a “qualifying” vehicle you cannot enjoy Cruisin’ the Coast®. 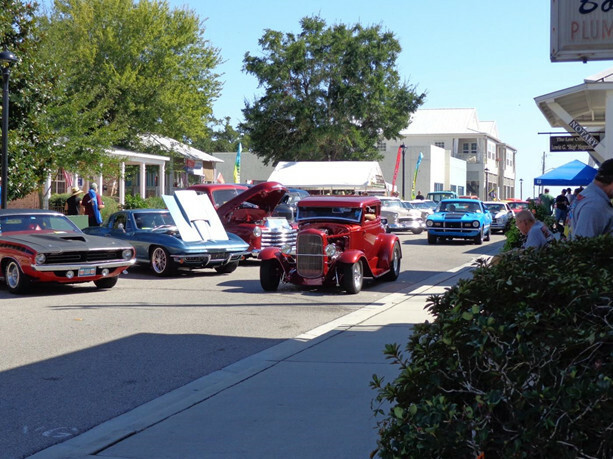 Because the majority of events occur on public roads and the various venue events are open to all, there is no reason that you should not attend and enjoy Cruisin’ the Coast® regardless of the age of your vehicle. The drive down was uneventful until we were approaching Montgomery. Because we left early to clear Atlanta before the morning rush hour and because of the time zone change we were in Montgomery’s morning rush hour. Typical stop and go traffic that became really exciting really quick. I can say that Jan & Steve and Georgianna & I were as close as could be to being involved in a major accident without actually having a bent fender or two. As it was our Saleen sustained paint damage due to pieces of plastic bumper supports flying out from the 4 car chain reaction wreck in the lane beside us. Happily the balance of the 6 hour drive to Biloxi was without any additional excitement. We checked into our motel, unloaded and headed out to see what Cruisin’ the Coast® was all about. As we headed West on US-90 to the registration site we were immediately engulfed in a slowly rolling car show. This was to be the normal traffic pattern for the rest of the week. 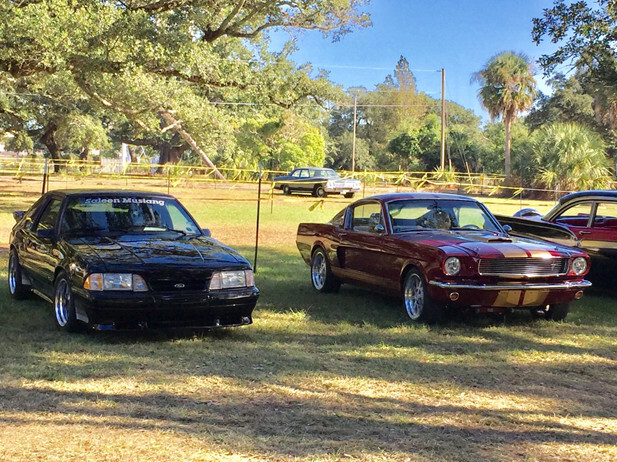 As we discovered, the best way to enjoy Cruisin’ the Coast® was to either find yourself a shady spot somewhere along US-90 and watch the parade of Hot Rods drive by or in a similar vein find a good spot at one of the venues and watch the Hot Rods drive by. We used both approaches during our time there. At registration we found a shady place to park, strolled around looking at the cars and of course bought shirts and ate ice cream. Our first venue after registration was the Margaritaville Casino. The casino blocked off one of their parking lots for Cruisin’ the Coast® participants. In the parking lot there was food (cheese burger in paradise! ), music and some fun games. We found great parking places where we could enjoy the event and also watch the cars going by on US-90. In Pass Christian we watched legal, city police approved burn-outs after which we found a good shady spot to watch the Hot Rods cruise by. That afternoon, a half block away, there was a group called “NA NA SHA” performing a 2 hour concert. What could be better Hot Rods and Oldies Music! Of all of the venues we visited, we considered this location in Ocean Springs the best. Ocean Springs is a nice little town with many food choices and more importantly a lot of shaded spots along the street. 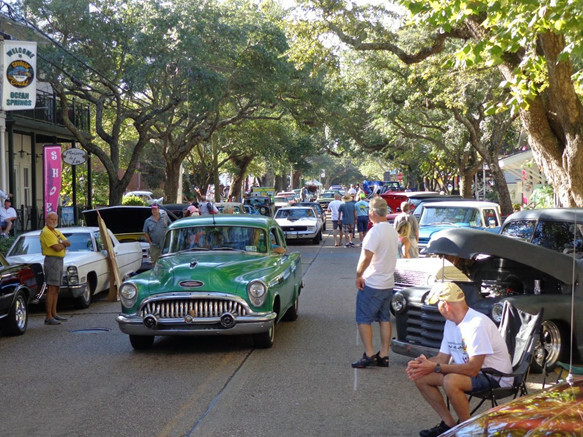 We stayed in Ocean Springs for a little over 4 hours watching the non-stop parade of Hot Rods roll-by. 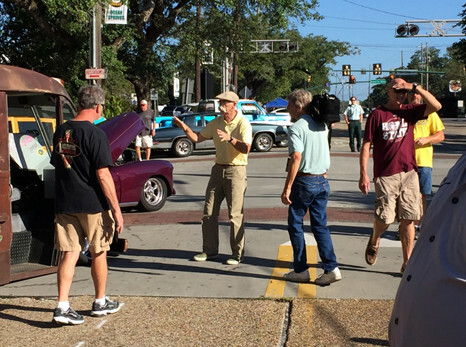 We were surprised to find Dennis Gage in Oceans Springs filming (taping?) a segment for his show “My Classic Car” as the Cruisin’ the Coast® schedule had him in Pass Christian that day (Friday). I guess hurricane Nate changed his schedule as well. He took a little time out to sign autographs for us and chat – nice guy! We left a day early due to hurricane Nate’s projected land fall. When we left on Saturday morning the weather was cloudy, but up to that point the weather had been great with clear blue skies. Many people left Friday afternoon but since we had tickets to the Beach Boys we decided to stay and enjoy the concert. 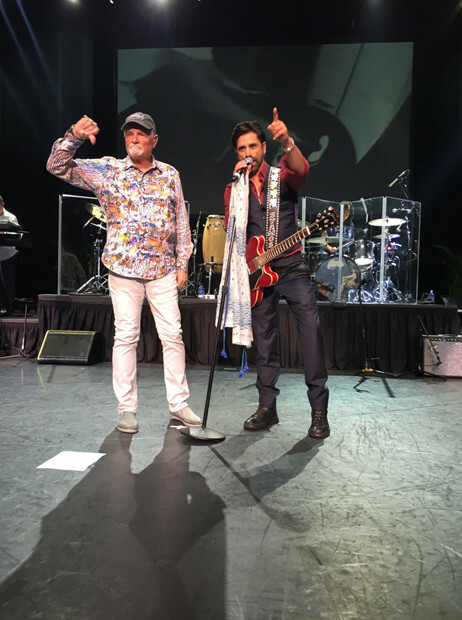 In the picture below can you guess who has joined Mike Love & the Beach Boys on stage? The guest performer played the guitar, sang and was killer on the drums! A gold star if you guessed John Stamos! After thoroughly enjoying the Beach Boys we headed back to the motel and packed as much as we could for Saturday morning’s early departure. This was the first time being chased out of a car show due to a hurricane! After having a bit of excitement on the trip down, thankfully the drive back to Atlanta was without incident. In closing, if you enjoy seeing a wide variety of Hot Rods from barely driveable street gassers or restored stockers or rat rods, Cruisin’ the Coast® is the show for you.